In March 1862, in Middleport (Iroquois County), Moore was enlisted in Company C of the Fifty-First Illinois Infantry. By that time the regiment had completed formation and training at Camp Douglas in Chicago and (on February 14, 1862) had departed for Cairo, Illinois and Bertrand, Missouri. Moore joined the regiment and was mustered in at Bertrand on March 9. From then on, he was continuously on duty with the regiment until the second day of the Battle of Chickamauga, September 20, 1863. Five lines deep they came swinging around our flanks. The odds were too great. No men could stand it. The fire was tremendous, the noise deafening, the crack of musketry, the booming of cannon, the shouts of officers, the frantic terror of riderless horses combined with the shouts & yells of either side as the other would waver for the moment—was the most terribly grand scene I ever witnessed. My company fought like devils. I shouted till my mouth was parched as dry as a husk & I was so hoarse I could hardly speak... But it was too much for human nature to bear. We fell back & reformed on the brow of a hill about half a mile to the rear." (Letter, Oct 11th 1863, Chattanooga, Tenn, Tilton Family Papers, Library of Congress). Moore did not fall back with the rest of the company; he was wounded twice in the melee, in the ankle and in the head, and was captured on the field by Confederates. The wound to his ankle was not serious enough at the time to prevent his marching to Dalton with his captured comrades and then traveling by train to Richmond where he was processed into the Confederate prisoner-of-war system on September 29, 1863. In December, he was moved to the prisons in Danville, Virginia along with many others. There, Moore fell ill. When other of his comrades were transferred to the new prison at Andersonville, Moore was left behind, too ill to be transported. He was moved back to Richmond and admitted to the prison hospital there on April 22, 1864, suffering from acute diarrhea. His Confederate prison-keepers paroled him on April 30, 1864 at City Point, Virginia. Moore was put aboard the Steamer New York, along with other paroled prisoners, and transported out to the Chesapeake Bay and northward to Annapolis where he was admitted immediately to federal military hospital. But, it was too late for him. In less than a week, he died of his illnesses—on May 8, 1864. The cause of death was listed as "pleurisy with extreme effusion". Military records provide no further information as to the underlying cause of Moore's lung infection. His military records state that he was buried on May 10 at Ash Grove Cemetery, which became, in time, the Annapolis National Cemetery. 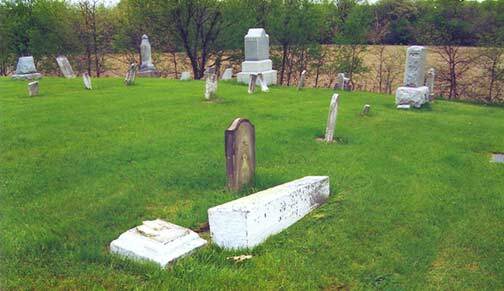 His grave is currently listed there in Section K, Site 890 (see gravestone below). 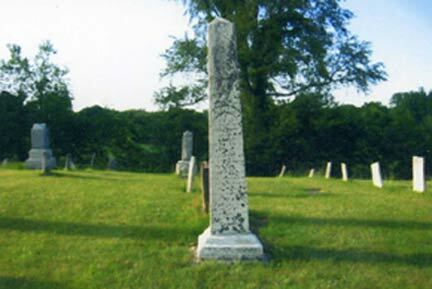 The Fallen Obelisk at Belmont Cemetery, Iroquois County, Illinois. But, this was not quite the last word on Jasper Newton Moore. There is also a stone monument to Moore in the cemetery in Belmont Township—most likely a memorial stone, as there is no record of Jasper's remains being reinterred to Belmont. The obelisk is shown in this pictures and reads: "Jasper N. - son of - Wm. 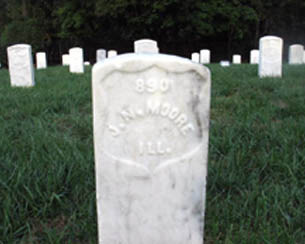 & E. J. Moore - DIED - May 8, 1864 - AGED - 20 Years 1 mo - & 7 dys - Enlisted in - the 51st Ill Reg - Co. C - Mar 3, 1862 - was wounded - and captured - in the battle - at Chicamauga - Sept 20 1863 - kept prisoner - 7 mo & 23 ds - CSA hanged - May 8, 1864." Moore family descendant Don Heflin had the obelisk set back on its foundation as shown in the Illinois-green picture at left. The arcing text on the stone reads "JASPER N". The Stone 890 at right below marks Jasper's grave at the Annapolis National Cemetery. 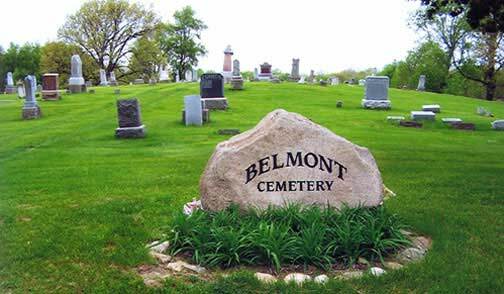 Many thanks to Don Heflin, a descendant of the Moore families, who provided family information, researched the cemeteries of Jasper N. Moore, and arranged for the Belmont and Ash Grove pictures. Jasper N. Moore, Compiled Service Record, Records of the Adjutant General's Office, 1780's-1917, Record Group 94, National Archives and Records Administration, Washington, D.C.
Jasper Moore, Pension File, Records of the Veterans Administration, Record Group 15, National Archives and Records Administration, Washington, D.C.
Chickamauga Casualty List, Regimental Books Fifty-First Illinois Infantry, Record Group 94, National Archives and Records Administration, Washington, D. C.
United States of America, Bureau of the Census. Seventh Census of the United States, 1850. Washington, D.C. Jasper is listed as "Jasper Moor" in this census.